There is an opinion out there that President Trump, and his statements and actions, have been sucking the media oxygen from other newsworthy stories that are in the world. Case in point, the fact that Pope Francis is visiting the United Arab Emirates, the first Catholic Pontiff to visit the Arabian Peninsula. Conventional wisdom is that he is making this visit to promote cordial relations between the two largest international faith communities in the world. Speculation has it, that in trying to establish friendlier relations with Arab leaders, the Pope is trying to improve the lot of minority Christian communities that exist in the majority Muslim nations. John Allen, Jr. of Crux Now, has some good analysis of this trip. It can be said that Pope Francis is walking in the footsteps of his namesake, St. Francis of Assisi. Francis lived during the time of the Crusades, when Muslim armies had occupied Jerusalem and the rest of the Holy Land; and Christian kings, knights, and common soldiers were marching to reconquer them. Much blood had been spilled during battles and massacres. And the slaughter showed no sign of ending. Onto this stage of hatred and killing, came this barefoot Italian holy man, dressed in a patched brown robe, with only a few companions. He traveled to Egypt and went first to the Crusader camp. It is written that Francis was horrified at the conditions he found. Soldiers who were suppose to be on a holy quest, were boasting of the Arabs they had killed, of the wealth they had plundered, and the women they had abused. He saw the sick and the wounded, and supposedly work in what they called hospitals, to care for them. He became more determined to end this war, by going, unarmed, into the Muslim camp, convince them to accept the Gospel of Jesus Christ, and negotiate a peace with the Crusaders. Anyone of the Crusaders who may have heard this plan would have thought that Francis was either suicidal, mad, or both. They fully expected to see his head on a pike soon. In what could only be considered a miracle, Francis found himself before the Sultan, who could not figure out who he had before him. Francis did not threaten God’s wrath, but instead he spoke of God’s love. He proclaimed the Gospel of Jesus Christ, of a loving God, in whom all people were one. Francis showed respect to the Sultan, and a desire to stop the slaughter on both sides. Ultimately, Francis failed to convert the Sultan, but he did win his respect. As a token of that respect, the Sultan gave an ivory horn to Francis, which is said to be on display in the Basilica dedicated to him in Assisi. Francis is also said to have received a pass that allowed him to visit the Holy Land. What the Crusaders could not win by force of arms, Francis achieved by only loving the Sultan and his people. Pope Francis is now on the Arabian Peninsula, hoping that by showing respect and love in the same way, he will be able to win peace in the region, and tolerance for his flock. 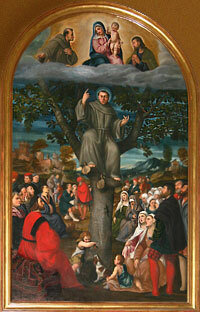 Through the intercession of St. Francis of Assisi, may God make it so.